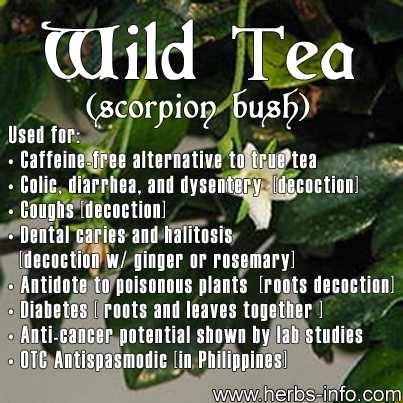 The scorpionbush or wild tea is a local medicinal shrub that prolifically grows all throughout the Philippines, commonly found in provinces, thickets, groves, and forests with the occasional evidence of bushes found in cities and towns where un-tampered vegetation is still allowed to thrive. Outside of provinces and rural areas, wild tea can be found growing (luckily) along the sidewalks and near open, untended lots alongside grass, weeds, and other wild vegetation. While commonly thought to be native and endemic to the Philippines, wild tea can also be found in vast numbers in equally forested areas in China, Taiwan, and some parts of Indonesia and Malaysia where it is employed not only as a medicinal herb, but as a starter plant for bonsai trees. As with most folkloric medicinal plants, every part of the wild tea bush can be used as a medicine, although the most commonly used part is (of course) the leaves, which are harvested, dried, and packed into tea bags and sold as a caffeine-free alternative to true tea (camellia sinensis). Typically marketed alongside other herbal 'readily-prepared' beverages, such as salabat (ginger root tea) and cassia slimming tea, it is popular only with the elderly. These dried and bagged leaves are often made into infusions, although their medicinal value drops significantly due improper packaging or processing. When wildcrafted however, wild tea can be made into either decoctions (when used fresh) or infusions (when air or sun-dried), and used to treat a wide variety of ailments, the most common of which are colic, diarrhea, and dysentery . It use as a soothing tonic is popular in the provinces, especially as a treatment for bottle-fed babies who often suffer from colic, as the herb, in small quantities, are safe for babies' consumption. A strong decoction of the leaves may also be used as a remedy for coughs, either by itself alone or used alongside other known expectorant herbs such as blumea camphor and wild oregano . Because of its antibacterial properties, a strong decoction of the leaves mixed with ginger or rosemary may also be used as a mouthwash to help protect from dental caries and halitosis, although a better mouthwash remedy would be half a cup of wild tea decoction mixed (warm) with one teaspoonful of rock salt (not the iodized kind). This disinfectant property has made the leaves of the wild tea indispensable for midwives who use a cooled decoction of the leaves as a disinfectant wash for both the mother and babe after birthing. Aside from its leaves, the roots of the plant may also be harvested and used medicinally, more often alongside the leaves than not, although some herbal remedies do call for the use of only the roots. A very strong decoction of the roots makes for an excellent antidote for poisonous plants, especially for those who unwittingly eat poisonous berries or leaves, or for individuals who have been poisoned by ill-prepared cassava root. The roots are also helpful for diabetics, especially when combined with the leaves. One can either make a strong tea of the combination of leaves and roots to be consumed daily or extract its potent compounds by chopping the roots and leaveAntis, and then macerating the combination in water overnight . This is then squeezed using fine cheese-cloth or linen, and the ensuing juice taken twice daily with meals.